In computing, DDR4 SDRAM, an abbreviation for double data rate fourth generation synchronous dynamic random-access memory, is a type of synchronous dynamic random-access memory (SDRAM) with a high bandwidth ("double data rate") interface. It was released to the market in 2014. It is one of the latest variants of dynamic random access memory (DRAM), some of which have been in use since the early 1970s, and a proposed higher-speed successor to the DDR2 and DDR3 technologies. It is not compatible with any earlier type of random access memory (RAM) due to different signaling voltages, physical interface and other factors. It was released to the public market in Q2 2014 with a focus on ECC memory, and an anticipated launch for non-ECC modules in Q3 2014. 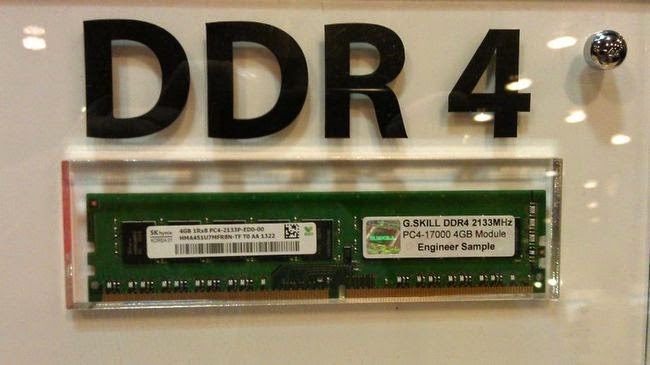 The primary advantages of DDR4 as opposed to its predecessor, DDR3, include higher module density and lower voltage requirements, coupled with higher data rate transfer speeds. DDR4 operates at a voltage of 1.2V with frequency between 1600 and 3200 MHz, compared to frequency between 800 and 2400 MHz and voltage requirement of 1.5 or 1.65V of DDR3. Although a low-voltage standard has yet to be finalized, it is anticipated that low-voltage DDR4 will run at a voltage of 1.05V, compared to DDR3's low-voltage standard (DDR3L) which requires 1.35V to operate. DDR4 modules can also be manufactured at twice the density of DDR3.